It had been many months since we had seen our dear friends Robin and Deb (Ace). Last spring they purchased and replaced the trailer on their lake lot and also because new grand parents. So between the two “life” events and our busy schedule, things have been pretty busy and we just hadn’t gotten together. We had a change in our plans and Chris decided to call Ace mid week for a short notice invite for dinner and wine. They arrived around 6pm Saturday after spending the afternoon with their beautiful grand daughter. It was my job to figure out the wine that we would enjoy with our dinner! Chris was preparing my favorite garden green salad, along with a pork chop in a white rosemary sauce and some scalloped potatoes. I decided I wanted to pair the food with a Zinfandel. I had many choices to choose from, Titus, Robert Biale, Cosentino, Kunde just to name a few. 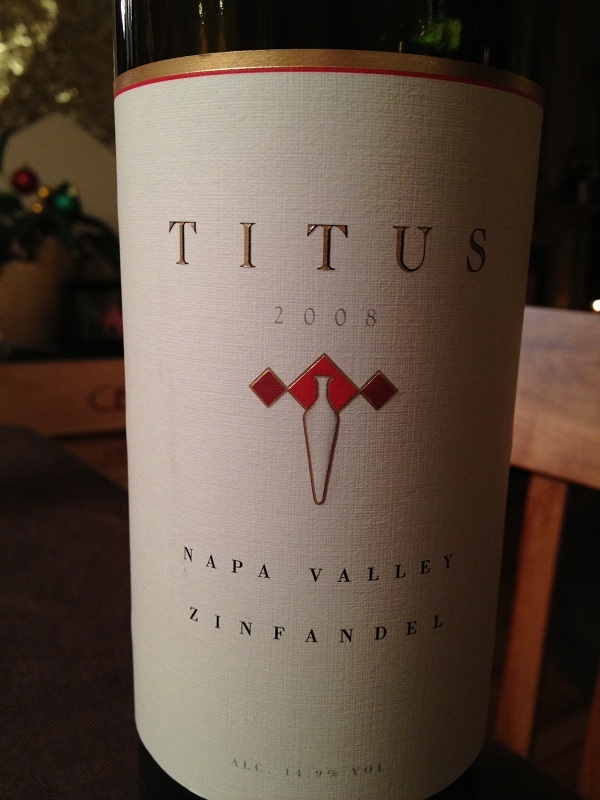 It had been quite some time since we had enjoyed a Titus Zinfandel so I chose the 2008 Titus. As Chris was preparing the dishes, I grabbed my tasting sheet and pen. I decided to rate the 2008 Zinfandel while we ate our excellent meal. The color was purple and the color depth was medium. The Zinfandel was very aromatic and smelled fruity. I could smell spices. 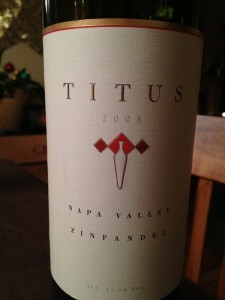 The Titus Zinfandel was slightly dry and full bodied, while the tannins were medium and soft. The finish was medium. Some of the flavors I could noted were spice, ripe dark fruit, vanilla, and jammy fruits and this Zinfandel was very flavorful. As I expected the Zinfandel paired with our food. 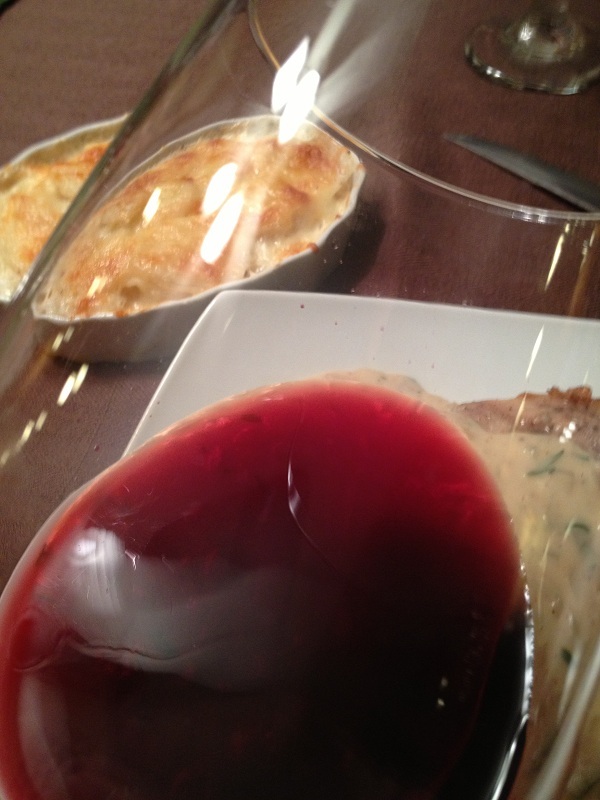 The slight tannins with the spice in the Titus wine really worked with Chris’ white rosemary sauce. We ended the night late having a great time playing cards. Us guys beat the girls three out of three games! I see a rematch in the near future! Our friends decided to stay the night since we consumed a few bottles of wine and driving just wasn’t an option. I rated the 2008 Titus Zinfandel three glasses.